Henry--a Canadian Mountie like his father--struggles between the call of duty and the call of his heart. When he informs a young logger's wife of her husband's death, the memory of that loss haunts him for years. Assigned to a new beat five years later, he rediscovers Amber and gains her trust...and eventually her heart. Janette Oke, recipient of the 1992 ECPA President's Award and the 1999 CBA Life Impact Award for her significant contribution to the Christian book industry has also won both the Gold Medallion Award and the Christy Award for fiction along with the hearts of millions of readers! Janette and her husband, Edward, live in Alberta, Canada. 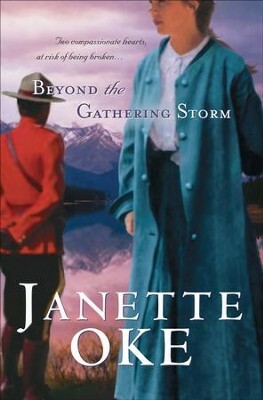 I'm the author/artist and I want to review Beyond the Gathering Storm - eBook.